Today I watched as teenagers let go of strings, and dozens of yellow balloons floated up and away into the sky...It looked so wonderful and photogenic. Yellow polka dots against a background of white, blue and grey. A perfect moment for a photographer. If it wasn't so obvious to me where these plastic and string things end their journey. I live next to the Atlantic Ocean. Near streams and rivers and beautiful lakes. On Earth, just as you. 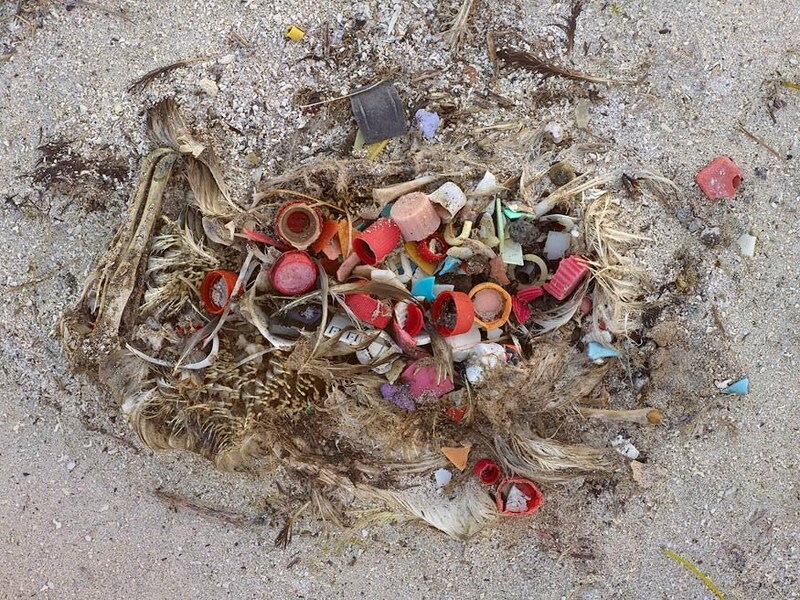 If all works out, we’d like to go to Midway Island later this year, in the middle of the Pacific, and do something about the albatross. 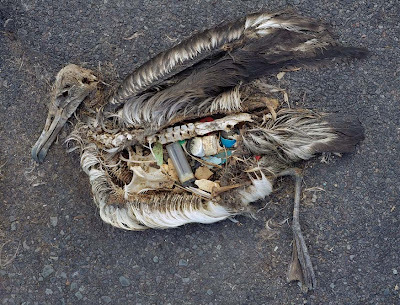 These birds are dying because of plastic pollution; they’re feeding their offspring with pieces of plastic found in the ocean, and the young birds die tragically. click on these and look what's been eaten. 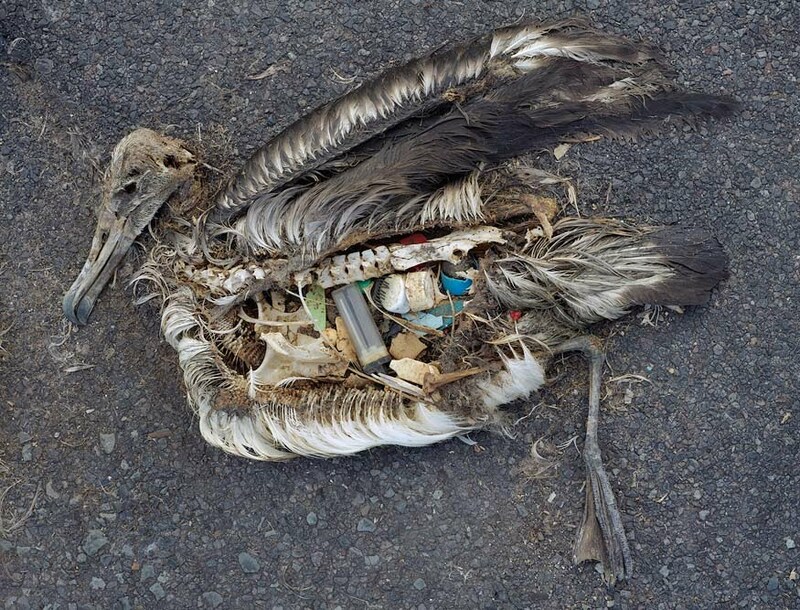 “The nesting babies are fed bellies-full of plastic by their parents, who soar out over the vast ocean collecting what looks to them like food to bring back to their young. 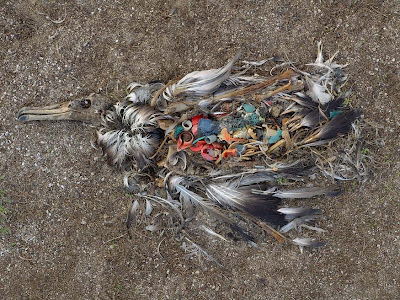 On this diet of human trash, every year tens of thousands of albatross chicks die on Midway from starvation, toxicity, and chocking.” Jordan’s images document the actual stomach contents of baby birds in one of the world’s most remote marine sanctuaries, more than 2,000 miles from the nearest continent. He hasn't added or taken anything away from the bodies but photographed each as it was found. 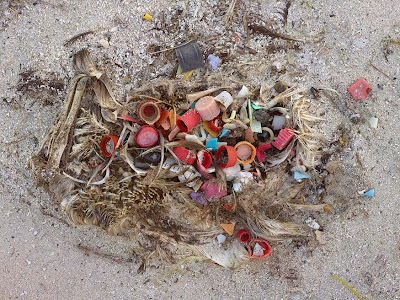 -Jordan, Chris, “Opening / A New Way of Seeing: Stations of the Albatross,” Spirituality & Health, January/February 2010. As photographers and artists we see and usually appreciate the beauty around us. 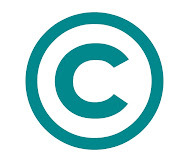 Remember not to compromise the environment for your art. Future Artists and people need it too. Oh and try not to lose your helium balloon! Those photos are some of the most painful I've ever laid my eyes on. I really had no concept of this problem before ... the ingesting of these objects. I did witness one gull flying by one day with a metal clothes hanger wrapped around it's neck. That was difficult enough to see. This ... this is horrific. If I have round plastic rings from juice or any other bottle, I always cut it half as I've also seen a bird with one around it's neck. Thank you very much for bringing this to light, Andrea. I finally stopped buying plastic water bottles and now use my Brita. I'd drink tap water but it tastes so chlorinated. I'm buying less packaged food and items in general. I'm composting now. I'm trying. egad. those images hurt my soul. Andrea, thanks for posting these photo's...they're shocking and hard to see but do more to bring awareness than mere words. these are disturbing images, and each time I see or hear things like this, I feel like humans really haven't learned anything. I pray we wake up before it is too late. Thanks for sharing the article and the photos....Disturbing, but it needs to be seen. Thanks for posting these photos. Sometimes the truth is painful but this is something we all need to know. ...i've often questioned "where's our VOICE?" over concerns & issues (such as the one you have shared with us today) with the world & the leaders..."why aren't we SCREAMING? "...we humans seem to be rather soft spoken, even QUIET...what are we waiting for?...BRAVO to the Chris Jordan photo project, perhaps showing the damage over & over & over will open our mouths & put words into action...THANK YOU for sharing this...your voice is out there & it MAKES A DIFFERENCE!